Actions speak louder than words. That’s true in Fairfax County, Virginia, where we boast diversity that is reflected in our schools, businesses and communities. This county has the 10th largest public school system in the nation, and its students experience high test scores and graduation rates. It’s also the county where my three sons of African-American and Hispanic descent were born, attended public school, met friends from all over the world and grew from these experiences. We all enjoy the fruits of our diversity. As we face yet another election year (including primaries) in Virginia, knowledge of our hard-won progress also produces a challenge to our community. We still have work to do to truly address the concerns of all of our citizens. We have a better chance of success when we embrace our diversity at every level, including our elected representatives. That’s why I was glad to see House of Delegates winners like Kathy Tran, Jennifer Carroll Foy, Elizabeth Guzman, Danica Roem and the most recent primary victor, Ibraheem Samirah, who is the Democratic nominee in the 86th district, a seat formerly held by Jennifer Boysko. An appreciation of our diverse culture should also be seen in the actions of our elected officials. As my dear friend and our Lieutenant Governor, Justin Fairfax says, “Virginia, is re-birthing democracy in the place where it was born.” I was proud recently to see Fairfax, who normally presides over Richmond’s upper chamber, step off the dais in protest to a tribute to Confederate General Robert E. Lee. His actions send a clear message: the Virginia Legislature and our electorate should reflect and support the diversity that has brought us much growth and success. Fairfax’s actions were the right thing to do and I step in solidarity with him. From the Revolutionary War to the voting rights restoration movement in Virginia, our state has a long, rich history. Fairfax County is an amazing community. We are all beneficiaries of the growth and progress that Fairfax County has experienced, and we recognize that our democracy is being challenged in the electoral process. I urge my fellow Democrats to continue the good fight, support qualified candidates from diverse backgrounds and stand arm in arm in our democracy. After all, this is Virginia and we are Fairfax County. Let’s continue to show folks how true democracy works. 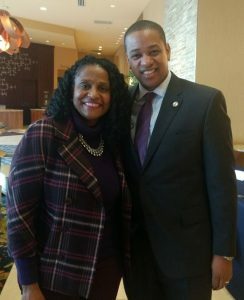 Karen Keys-Gamarra is currently serving as an At-Large School Board member in Fairfax County and is up for re-election on November 5th, 2019. For more information on Karen, go to her Facebook or Twitter.